Forced to flee into the mortal world with her family, Jacinda struggles to adapt to her new surroundings. The only bright light is Will. Gorgeous, elusive Will who stirs her inner draki to life. Although she is irresistibly drawn to him, Jacinda knows Will's dark secret: He and his family are hunters. She should avoid him at all costs. But her inner draki is slowly slipping away; if it dies she will be left as a human forever. She'll do anything to prevent that. Even if it means getting closer to her most dangerous enemy. Let me start off by saying that Firelight was not what I thought it was going to be AT ALL. Firstly, I did not realize that it was set in present day. I was expecting a time when things like jeeps (I was startled when I was reading about vehicles) did not exist. Secondly, I thought this book had dragons. Like big, huge dragons. Instead they're draki, descendants of dragons. (I'll get more into that later.) This wasn't a bad thing, just totally not what I thought I was going to be reading. I think the modern setting actually worked fine for the story, but it fell a bit short in other spots. I don't think I had one big issue with this book. It just lacked a Wow Factor and had some little things I didn't like, and it all added up to make a book that was a little more than okay with a touch of lightheartedness and fun. Jacinda wasn't really an annoying MC--things were just too over-explained, or explained too many times, and it drove me a bit crazy. And there were several repeat words and phrases, something that can drive me crazy. Other than that, some things, like how the relationships worked (though I liked them), just seemed a little unrealistic and off. I liked the story in this book, but I wasn't in love with how it was written--it was missing something for me. That said, the writing was not bad--it was simple, with small bits of fancy wording, and a sense of fun and lightness. 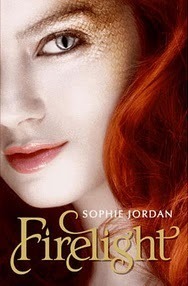 Firelight is a kind of breezy read, I think, not meant to be serious or dark. While it was slightly slow in some parts (and I'd peek ahead to see if certain characters would make an appearance or if something exciting was going to happen), it was enjoyable. Like I said earlier, it just wasn't what I expected. I don't mind the modern setting, but I think I'd want more with the draki. My biggest issue with that was that I just could not figure out what they looked like. More human or more dragon? I couldn't really paint a picture in my head of what was in the text, and I just really wanted to know what on earth they looked like. There were a handful characters that played important roles. It's told from the POV of Jacinda, a sixteen-year-old fire-breathing (which is very, very rare) draki (in short, a dragon). She lives with her mother and twin sister in their draki pride, but when Jacinda breaks a major rule her mother packs her and her sister up and they flee the pride in search of safety. They move to the desert, where Jacinda's mom hopes she'll able to, well, kill her draki and keep her human. The family kept tugging at each other--Mom not wanting Jacinda to be a draki (she suppressed hers years ago); Tamra, her twin sister who never manifested, just wanting to live a normal, human life. It puts a lot of pressure on Jacinda, who doesn't want to suppress her draki. I understood the family drama for the most part, but it was a lot of the same things being said over and over again. However, things brightened up for Jacinda when she met Will, and he also took interest in her. I liked their romance, and Will's protectiveness of Jacinda, but sometimes it was just a little...much? I'm not sure if that's the right word, but at the back of my mind I was thinking it was a little too instant, a little too unrealistic and such. While he was just a slight bit overbearing at times, I really liked Will and enjoyed it when he was in a scene. I did not, however, care for his cousins Xander and Angus--I don't think anyone likes them, really. Especially Xander. I think he'll become a bigger player in the rest of the trilogy. (They're a family that hunts draki, like Jacinda.) I'm interested to see what happens with Cassian--draki, next in line to rule the pride, "betrothed" to Jacinda--in the next two books of the trilogy. I can't tell yet if he's good or bad. Would I reread it? There's a small possibility, but not very likely. Would I recommend it? If you're looking for a light fantasy with a bit of dragons, some thrilling moments, and a nice romance, then yes. 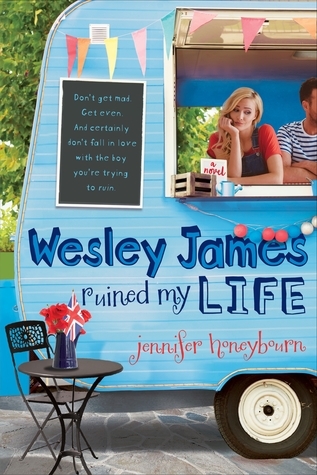 I was surprised by how much I liked the romance in this one-for whatever reason Will really appealed to me and kicked off my love affair with YA book boys named Will.